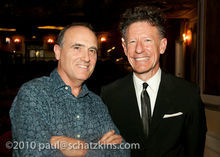 Picture shows Dana with Lyle Lovett. Dana Cooper (Pronounced Dayna, lest here be any confusion for Irish audiences!). Miracle Mile on Compass Records was nominated for a Nashville Music Award as “Best Pop Album” and was chosen by Performing Songwriter magazine as one of the top DIY recordings for the year. “Enough”, joins Cooper on vocals. “This veteran song poet is a self-contained road warrior--a man of many tunes and tunings, and a right hand few guitarists will ever know.